One of the overlooked advantages of homebrewing is that brewers maintain a stock of unusual ingredients and equipment on hand. One of most common ingredients across brewing is malt extract — for many brewers it is the main ingredient in their wort, but even after I’ve moved on to all-grain brewing I still need malt extract for yeast starters and priming bottles. I discovered that this ingredient is useful for making bagels, and my curiosity to try out a recipe was instantly piqued. Unsurprisingly, I ended up at Serious Eats, which is also the website that has guided me to some of my favorite bagel spots. The website furnished me with a simple recipe. The dough is similar to my pizza dough, except without oil and with substantially more yeast due to only allowing this dough a one hour rise (though there’s no reason you couldn’t do a cold fermentation). 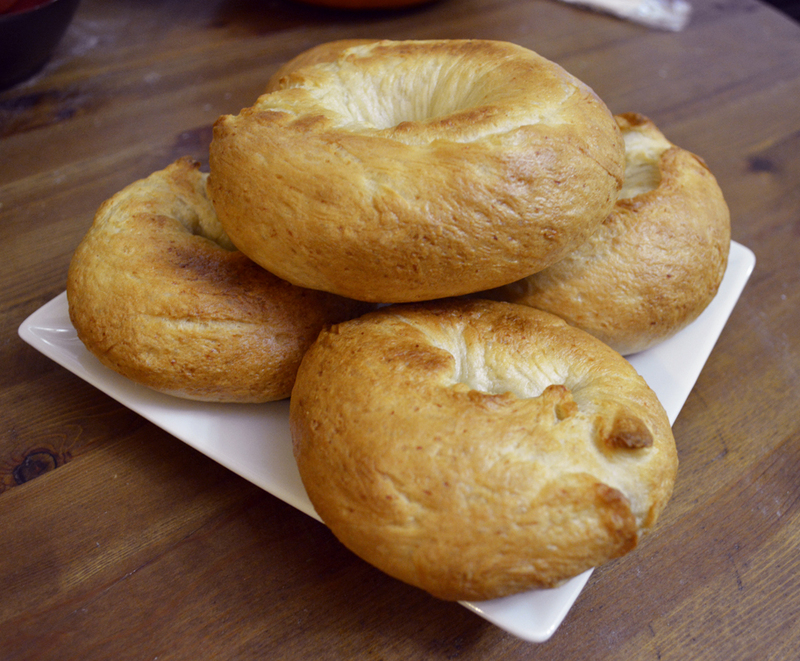 The unusual step that makes bagels chewy and dense is a brief boil to start setting the gluten before baking. 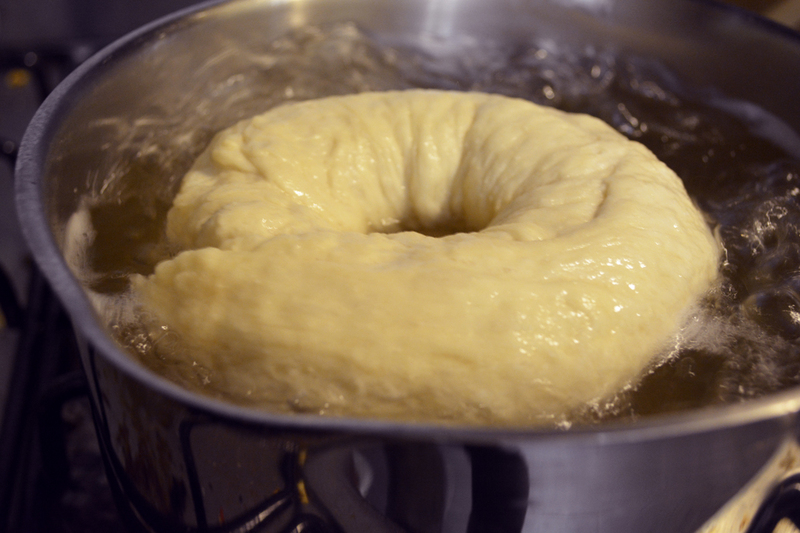 Additionally, the dough is flattened prior to forming the bagels, effectively degassing the dough which also prevents expansion of the dough during baking. The boil also serves an additionally purpose of introducing malt to the exterior of the bagel. I’m not exactly clear on the function of this step. It’s possible that the malt sugars help create the glossy brown exterior of the bagel. Malt also lowers pH when dissolved in water, so it’s possible that the low pH leads to this exterior, but I have also read of bagels and pretzels being boiled in solutions of baking soda or even lye which would raise the pH. I can’t find much about the underlying science. That said, the method with malt extract certainly works, though it’s unclear whether or not it’s optimal or necessary. It’ll be interesting to explore alternatives like baking soda or lye as well as longer ferments and other baking techniques in the future. If your best option for bagels where you live is frozen bagels at the supermarket, definitely consider giving this a try. It’s fun and weird (as far as baking goes) and delicious. This entry was posted in learning, recipes and tagged bagels, baking, baking soda, bread, dough, lye, malt extract, pH on November 10, 2013 by Dylan Bargteil.